To determine 2-year anatomical and functional outcomes after macular hole (MH) surgery. 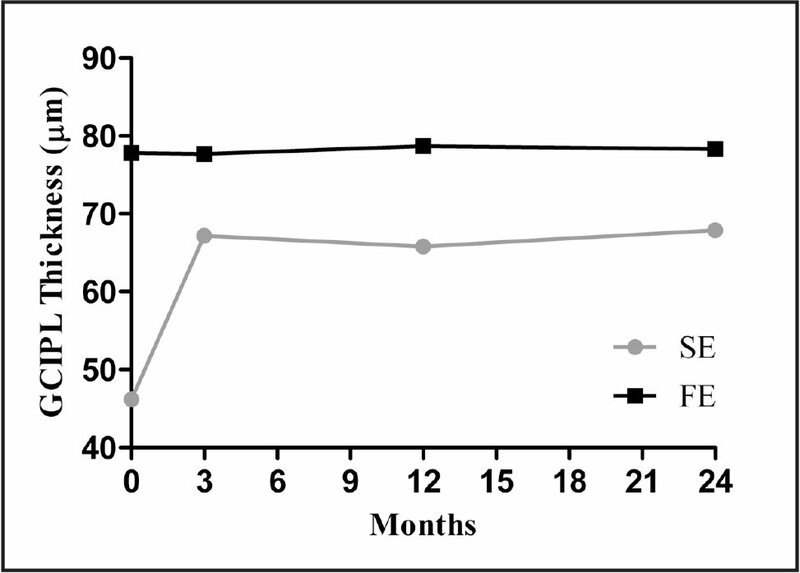 The surgical eye (SE) and fellow eye (FE) of 10 patients undergoing MH surgery were examined preoperatively and at 3, 12, and 24 months postoperatively. Retinal nerve fiber layer (RNFL), external limiting membrane (ELM), inner segment/outer segment (IS/OS) junction, cone outer-segment tips (COST) line, and ganglion cell inner plexiform layer (GCIPL) thickness were analyzed on spectral-domain optical coherence tomography. Inferior peripapillary RNFL was thinner in the SE at 110 ± 12.2 versus 123 ± 9.82 for FE (P < .05). Defect size in ELM (r = 0.61; P < .001), IS/ OS (r = 0.67; P < .001) junction, and COST (r = .67; P < .001) line correlated with visual recovery. Average GCIPL was thinner in SE compared to FE (P < .05). Eyes after MH repair demonstrated inferior RNFL and GCIPL thinning. Defect size in ELM, IS/OS junction, and COST line predicted visual recovery. To our knowledge, there are no prospective, controlled studies that have specifically investigated the long-term (2-year) relationship of anatomic and functional outcomes after MH surgery. With the availability of a medical alternative, greater understanding of anatomic and functional consequences after surgical management is needed to assess the risks and benefits of one approach versus the other. The primary intent of this study is, therefore, to analyze anatomic changes of the inner and outer retina on spectral-domain optical coherence tomography (SD-OCT) and functional changes on automated perimetry during the course of 2 years after surgery in order to provide greater insight into long-term visual outcomes after MH surgery. The Vanderbilt University institutional review board approved this study, and all patients gave informed consent before enrollment. The study complied with all aspects of the Health Insurance Portability and Accountability Act and was conducted in accordance with the tenets of the Declaration of Helsinki. The study is registered at clinicaltrials.gov (identifier NCT01162356). Consecutive enrollment took place at the Vanderbilt Eye Institute between April 2010 and February 2012. 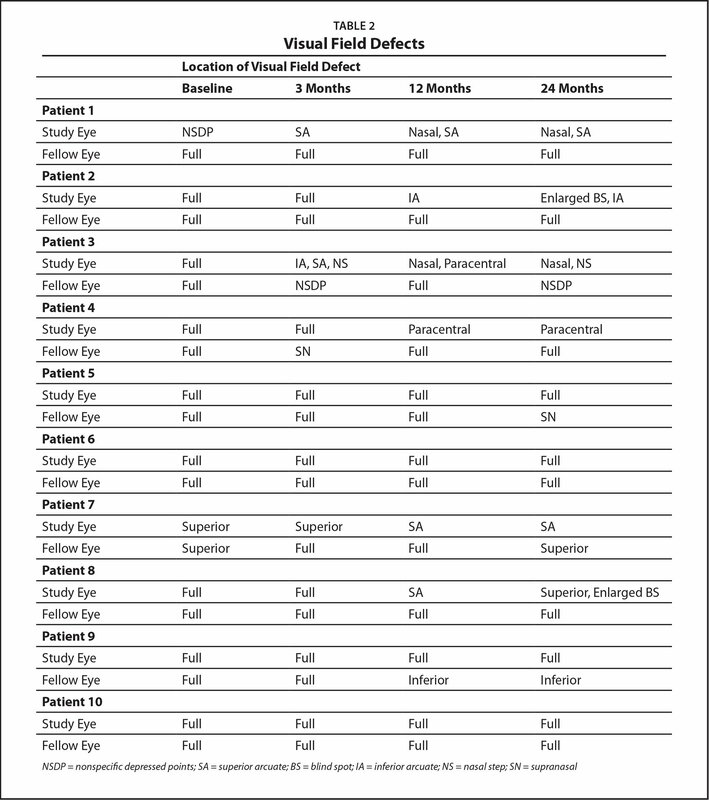 Ten eyes of 10 patients undergoing unilateral vitrectomy surgery were enrolled. Inclusion criteria included age of 18 years or older, planned vitrectomy for visually significant unilateral full-thickness MH, and the ability to comply with testing and long-term follow-up. Exclusion criteria included any media opacity that would interfere with imaging; history of glaucoma, uveitis, trauma, use of aqueous suppressants for ocular hypertension; history of advanced retinal disease (exudative age-related macular degeneration, diabetic macular edema, etc.) that would interfere with retinal thickness measurements; and history of previous vitrectomy in either eye or postoperative complications requiring repeat vitrectomy surgery within 3 months. Patients with disease in the fellow control eye that, in the opinion of the investigator, was likely to warrant future vitrectomy surgery were also excluded. Patient characteristics including age, gender, medication use, and lens status were recorded. All patients underwent comprehensive baseline testing of both their study (surgical) and fellow (control) eye within 4 weeks before their surgery. Testing consisted of a complete ocular examination by a fellowship-trained vitreoretinal surgeon, including best-corrected visual acuity (BCVA); glaucoma evaluation by a fellowship-trained glaucoma specialist; fundus and optic nerve photography; fundus autofluorescence (FAF); Humphrey visual field (HVF) testing; and macula and optic nerve SD-OCT.
Color optic nerve (30°) and fundus photographs of the macula (50°) were taken of the study eye (SE) and fellow eye (FE) by experienced photographers (Zeiss 450+ fundus camera; Carl Zeiss Meditec, Dublin CA; and OIS WinStation version 10.3, Ophthalmic Imaging Systems, Sacramento, CA). FAF imaging of the macula with an excitation filter of 580 nm (bandwidth: 500 nm − 610 nm) and barrier filter of 695 nm (bandwidth: 675 nm − 715 nm) was also performed. Visual fields were assessed before dilation utilizing 24-2 static white-on-white Swedish Interactive Thresholding Algorithm test program (SITA Fast, Humphrey Visual Field Analyzer; Carl Zeiss Meditec, Dublin, CA). HVFs were analyzed for location of VFDs, mean deviation (MD), and pattern standard deviation (PSD). SD-OCT images of the macula of both eyes were generated with the Cirrus OCT (Carl Zeiss Meditec, Dubin, CA) in accordance with the manufacturer’s instructions and as described in detail elsewhere.14 SD-OCT images were analyzed for changes in the RNFL, external limiting membrane (ELM), inner segment/ outer segment (IS/OS) junction, COST line, PROS length (the distance between IS/OS and retinal pigment epithelium), and GCIPL thickness (Figure 1). The PROS measurements were made using the manufacturer’s software (OCT4000, Cirrus HD-OCT; Carl Zeiss Meditec, Dublin, CA). The presence of a full-thickness MH precluded measurement of the PROS length at baseline, and measurements were only made at 3, 12, and 24 months after surgery. If a defect in the outer retina was present, PROS length measurements were made on adjacent sides of the defect and averaged. The GCIPL thickness was also measured using the manufacturer’s software.15 This algorithm segments the GCIPL and measures the thickness in an elliptical annulus (vertical and horizontal inner radius of 0.5 mm and 0.6 mm and vertical and horizontal outer radius of 2 mm and 2.4 mm, respectively).15 The algorithm identifies the RNFL and measures the GCIPL from the outer boundary of the RNFL to the outer boundary of the inner plexiform layer (IPL) and, therefore, includes both the retinal ganglion cell layer and IPL (excludes ILM). Spectral-domain optical coherence tomography of the macula showing the location of the external limiting membrane, inner segment/outer segment junction, cone outer-segment tips line, retinal pigment epithelium and photoreceptor outer-segment length measurement. An optic disc cube scan protocol was used to measure peripapillary RNFL thickness in a 6 × 6-mm2 area, consisting of 200 × 200 axial scans (pixels) at the optic disc region. The center of the optic nerve was automatically detected and a circle (3.46-mm diameter) centered over this point was utilized to obtain standardized measurements. Average and four-quadrant measurements of the peripapillary RNFL were used in statistical analysis. The cup volume was measured in millimeters cubed. Vitrectomy with induction of a complete posterior vitreous detachment (if not present) using 23-guage or 25-gauge three-port pars plana approach was performed in all cases. Triamcinolone acetonide was used to assist vitrectomy in six cases, and indocyanine green (ICG) staining of the ILM was performed and ILM completely removed around the fovea in all cases. A complete air fluid exchange was then performed in all cases, followed by exchange with sulfur hexafluoride (SF6) in seven cases and perfluoropropane (C3F8) in one case. Patients were instructed to remain facedown for 3 days postoperatively. All testing as described above was completed for all 10 patients at 3 months, 1 year, and 2 years after surgery. Descriptive statistics, including mean and standard deviation (SD), were calculated for case characteristics. Statistical software was used to analyze the data and generate tables and figures (GraphPad Software, La Jolla, CA; and Microsoft Excel Software, Redmond, WA). Statistical analysis of continuous variables was performed using the paired student t test, one way analysis of variance, linear regression, and Spearman’s correlation coefficient. Snellen visual acuity was converted to logarithm of the minimal angle of resolution (logMAR) for statistical analysis. A P value of less than .05 was considered statistically significant. All 10 SEs of 10 patients had a full-thickness MH with an average size diameter of 731 µm ± 270.66 µm measured at the level of the retinal pigment epithelium.16 Mean age of patients was 66 ± 4.59 years (range: 56 to 72 years). Eight SEs were phakic and two were pseudophakic at baseline; however, by 2 years, all eight SEs had undergone cataract surgery. There was significant improvement in logMAR BCVA of SE at 3 months (P < .001), 12 months (P < .001), and 24 months (P < .001) when compared to baseline (Table 1). Size of defect in ELM (r = 0.61, P < .001), IS/OS junction (r = 0.67, P < .001), and COST line (r = 0.67, P < .001) independently correlated with logMAR BCVA (Figures 2 and 3), but not PROS length (P = .21). At 2 years, the GCIPL thickness independently correlated with logMAR BCVA (r = −0.42, P = .02). Spectral-domain optical coherence tomography images of the macula over time. (A) Baseline image shows a full-thickness macular hole (MH). 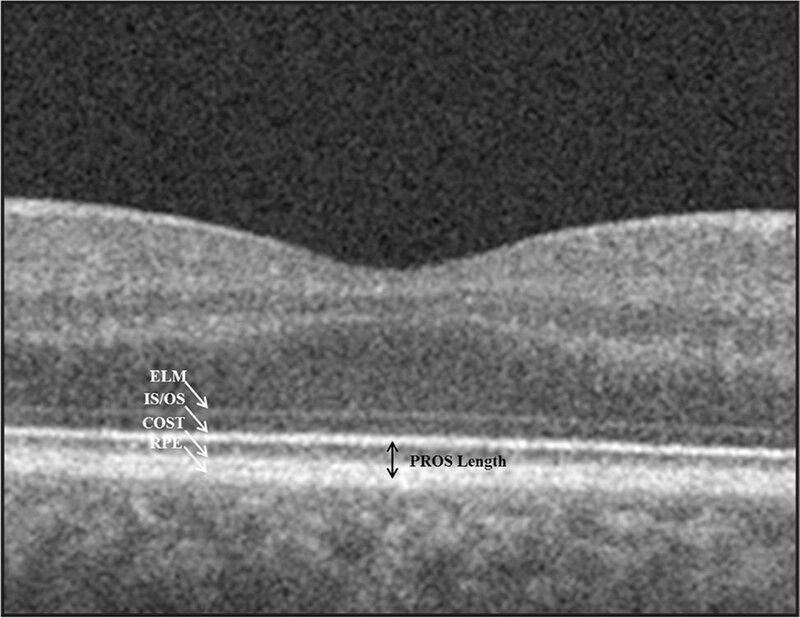 (B) Postoperative image at 3 months shows disruption of the external limiting membrane (ELM), inner segment/outer segment (IS/OS) junction, and cone outer-segment tips (COST) line with visual acuity (VA) of 20/50. (C) Postoperative image at 1 year shows an improved external limiting membrane, but slight persistent disruption of the IS/OS junction and COST line with VA of 20/30. (D) Postoperative image at 2 years shows recovered ELM, IS/OS junction, and COST line with VA of 20/20. Scatter plots showing correlation of defects in the outer retina with best-corrected visual acuity (BCVA). Size of defect in external limiting membrane (left), inner segment/outer segment junction (middle), and cone outer-segment tips line (right) significantly correlates with BCVA (r = 0.61, P = .001; r = 0.67, P < .001; r = 0.67, P < .001, respectively). Data include all values from baseline, 3 months, 12 months, and 24 months. MD on HVF was −2.39 ± 1.82 in SEs compared to −1.45 ± 1.19 in FEs (P = .27) at 24 months (Table 1). Mean PSD (a measure of focal visual field loss) of SEs was 3.25 ± 2.50, which was greater than in FEs (1.85 ± 0.50) at 24 months and approached statistical significance (P = .08). The PSD of SE at 1 year was significantly higher than PSD at baseline (3.50 ± 2.42 vs. 2.31 ± 0.83, P < .05), which improved at 2 years (3.25 ± 2.50, P = .13; Figure 4). VFDs were observed nasally, superiorly (Figures 5 and 6), and paracentrally (Table 2). Increase in pattern standard deviation (PSD) of study eye (SE) over time. There is an increase in PSD of SE at 24 months compared to fellow eye at 24 months and baseline. Composite graph of optic nerve color fundus photograph (below) and corresponding visual field (above) of patient 1 study eye taken at baseline (left), 3 months, 12 months, and 24 months (right) postoperatively. Note the superior and nasal defects over time. Composite graph of optic nerve color fundus photograph (below) and corresponding visual field (above) of patient 7 study eye taken at baseline (left), 3 months, 12 months, and 24 months (right) postoperatively. Note the superior defect and progression of blind spot over time. SEs had significantly thinner inferior peripapillary RNFL (110 ± 13.0 µm) when compared to FEs (126 ± 11.8 µm; P = .03) at 24 months (Figure 7) and to SEs (120 ± 8.05 µm; P = .01) at baseline. Both average GCIPL and individual GCIPL sectors (superior, superonasal, superotemporal, inferior, inferonasal, and inferotemporal) were all significantly thinner in SEs compared to FEs at 3 (P < .05) and 12 months (P < .04). At 2 years, the average GCIPL and majority of individual GCIPL sectors were significantly thinner in SEs compared to FEs (P < .05, Figure 8), except for the superior (P = .07) and superonasal (P = .07) sectors, which approached statistical significance. 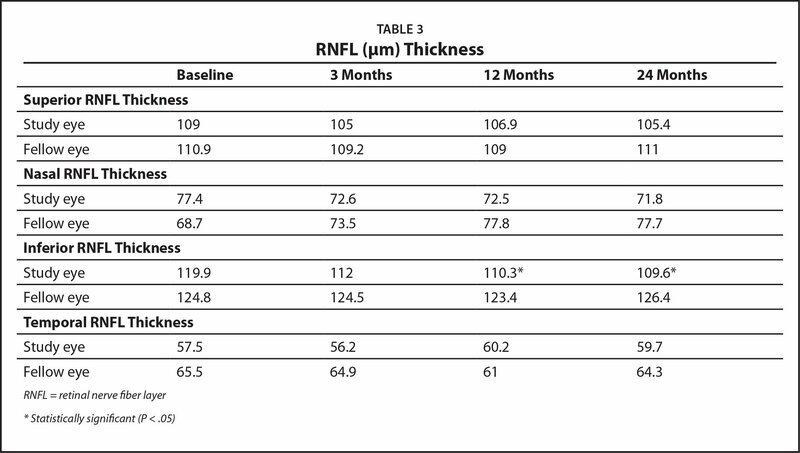 Decrease in inferior retinal nerve fiber layer (RNFL) thickness over time. 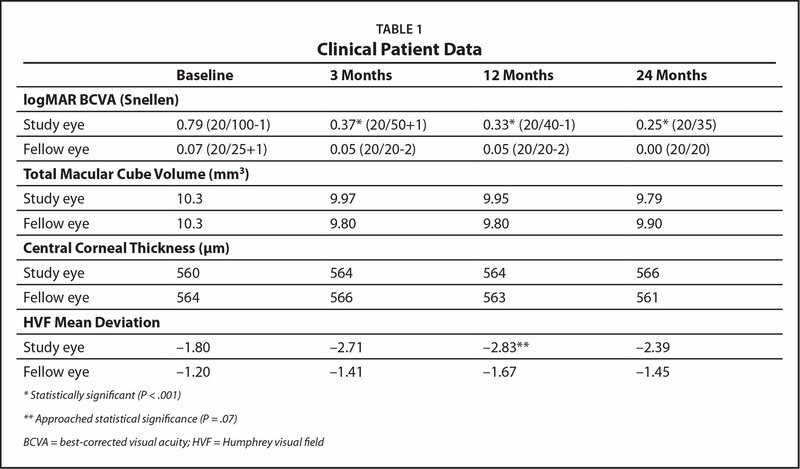 There is a significant decrease in RNFL thickness inferiorly of study eye at 24 months compared to fellow eye at 24 months (P = .03) and baseline (P = .01). 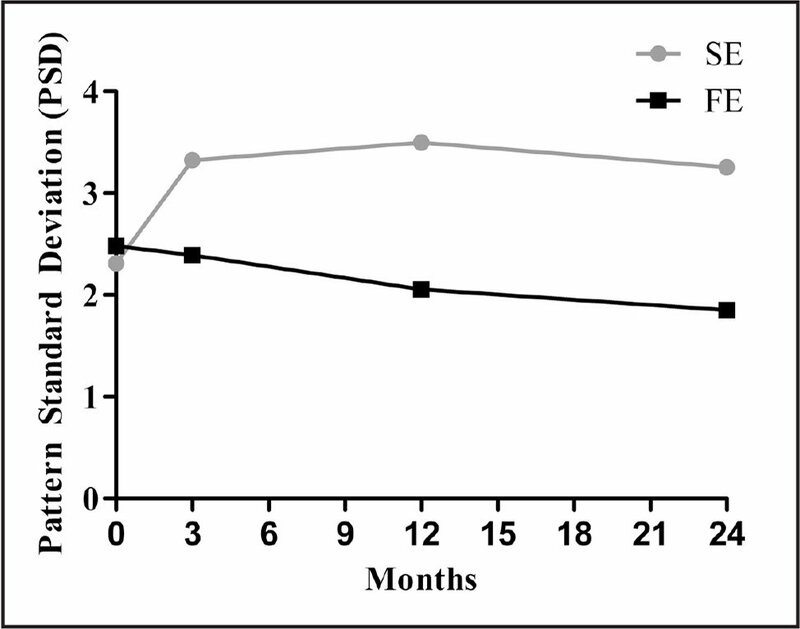 Decrease in average ganglion cell inner plexiform layer (GCIPL) of SE over time. 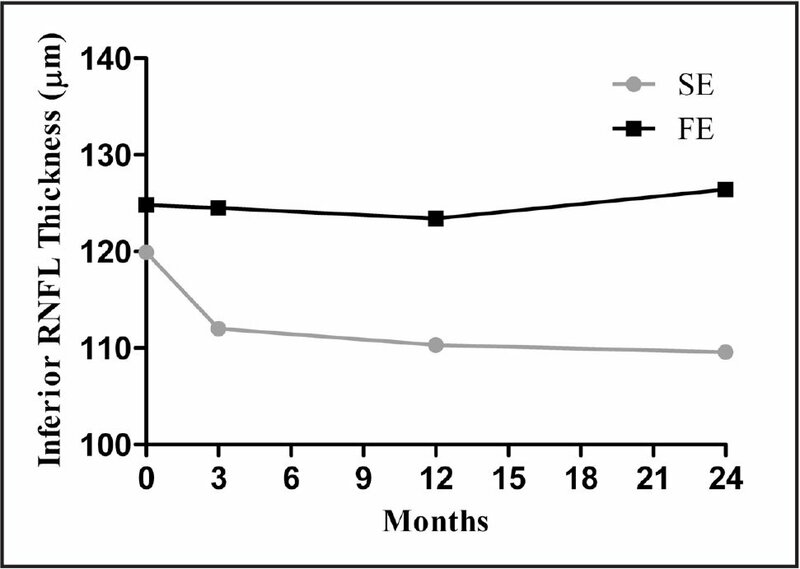 There is a significant decrease in average GCIPL of study eye (SE) compared to fellow eye at 3 months (P < .05), 12 months (P < .04), and 24 months (P < .01). Note that presence of macular hole prevents accurate measurement of GCIPL in SE at baseline. To our knowledge, this is the first prospective, controlled study that has focused on long-term anatomic and functional changes after MH closure. Our results demonstrate that reestablishment of the integrity of the ELM, IS/OS, and COST line, but not PROS length, significantly correlates with VA recovery, and that VFDs are relatively common after MH repair and can be accounted for by RNFL and GCIPL thinning. Because of their potential importance, we focused on the above landmarks and followed their corresponding changes during the course of 24 months. The ELM was first to recover, followed by the IS/OS junction, and then the COST line. The size of the respective defects of each of these structures significantly correlated with VA. The strongest correlation was seen with that of the COST line, and there were no cases of a recovered COST line in the setting of a disrupted ELM or IS/OS junction. Therefore, our results indicate that reestablishment of the COST line is a pivotal predictor of VA recovery after MH surgery. In contrast, PROS length did not show any positive correlation with VA. Although PROS length has been reported to be a good predictor of VA in patients with idiopathic epiretinal membrane,17 its lack of correlation in this study is not surprising since baseline assessment for comparison purposes is not possible in full-thickness MH eyes. In addition to evaluating the outer retina, we also focused on inner retinal layer (RNFL and GCIPL) thickness. In contrast to outer retinal layers (where continuity correlates with VA), RNFL and GCIPL thickness appear to reliably predict functional outcomes.18–20 Our analysis of peripapillary RNFL thickness showed significant inferior thinning in SEs, which was evident at 3 months and continued to progress out to 24 months. To our knowledge, this finding has not been previously reported. Similarly, GCIPL analysis in our study showed significant thinning in SE at 3, 12, and 24 months, but unlike RNFL, was observed in the majority of individual sectors suggesting more global loss. Our above anatomic findings are consistent with visual field changes documented on perimetry (Figures 5 and 6). There was a clear trend of decreased MD and significantly higher PSD in SEs at 24 months. Superior, nasal, and/or paracentral VFD were observed in six of 10 SEs, which can be accounted for by corresponding inferior peripapillary RNFL thinning and GCIPL loss around the fovea and affecting the papillomacular bundle. Although the exact cause for VFD is unclear, ICG is known to be cytotoxic and has been shown to cause ganglion cell and inner plexiform layer thinning in animal studies, which can be exacerbated by concomitant light exposure.21,22 All 10 eyes had exposure to ICG in this study. Thinning of GCIPL could also be explained by progressive damage from glaucoma, which has been postulated to occur following vitrectomy.23,24 Furthermore, GCIPL thickness has been observed to be thinner in patients with glaucoma.18,19 Finally, mechanical trauma may explain our finding of localized inferior RNFL loss. Greater blunt trauma to the inferior arcuate bundle could account for inferior RNFL loss, which may have resulted during ILM peeling (via forceps) or during air-fluid exchange (tip of aspiration instrument). As with all prospective studies, our results should be interpreted with caution. Our sample size was small and therefore may have caused us to underestimate or miss uncommon events. Despite this obvious shortcoming, we would like to emphasize the numerous strengths of this study, which include its prospective controlled design with baseline analysis and 2-year follow-up and rigorous assessment of anatomic and functional outcomes by advanced imaging. In conclusion, eyes that underwent MH repair with ICG staining and ILM peeling demonstrated significant inferior RNFL and GCIPL thinning, which corresponded to superior, nasal, and paracentral VFD. Degree of persisting defects in ELM, IS/OS junction, and particularly COST line significantly predicted VA recovery. These results, if confirmed by larger studies, may allow for greater clarity in predicting and explaining visual outcomes after MH surgery and in assessing the risks and benefits of surgery in comparison to medical management. 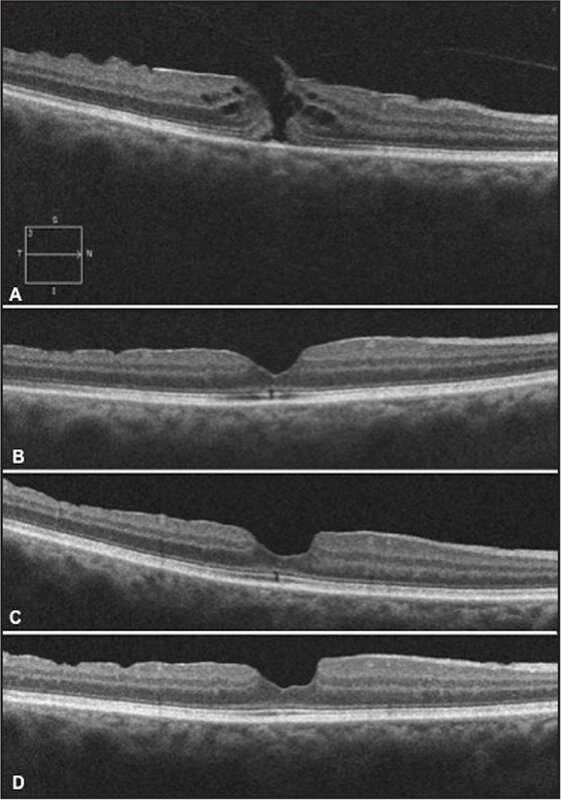 Chalam KV, Murthy RK, Gupta SK, Brar VS, Grover S. Foveal structure defined by spectral domain optical coherence tomography correlates with visual function after macular hole surgery. Eur J Ophthalmol. 2010;20(3):572–577. Reddy RK, Lalezary M, Kim SJ, et al. Prospective retinal and optic nerve vitrectomy evalation (PROVE) study: findings at 3 months. Clin Ophthalmol. 2013;7:1761–1769. Cirrus HD-OCT for Retina, Glaucoma and Cornea; Carl Zeiss Meditec, Owner’s manual. From the Vanderbilt Eye Institute, Vanderbilt University Medical Center, Nashville, TN. Presented in part at the Association for Research in Vision and Ophthalmology annual meeting in Seattle in 2013 and at the 38th annual Macula Society Meeting in Scottsdale, AZ, in 2015. Supported in part by an unrestricted grant from Research to Prevent Blindness New York, NY, to the Vanderbilt Eye Institute. Address correspondence to Stephen J. Kim, MD, Vanderbilt Eye Institute, 2311 Pierce Avenue, Nashville, TN 37232; email: skim30@gmail.com.